The Indiana University Sixth Annual Traditional Powwow, a celebration of Native American people and culture, will take place from 11 a.m. to 10 p.m. Saturday, April 8, in IU Bloomington's Dunn Meadow. 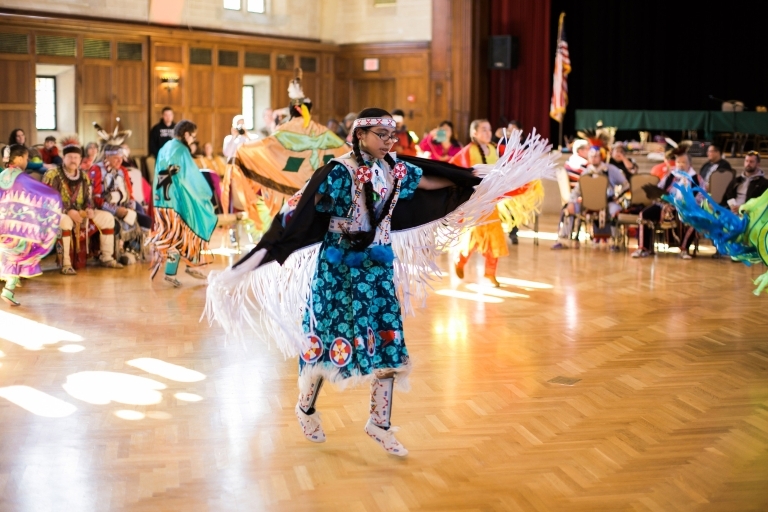 Hosted by IU's First Nations Educational and Cultural Center, an Office of the Vice President for Diversity, Equity and Multicultural Affairs, program, the powwow will feature traditional Native American dance sessions, singing, craft vendors, informational booths and food. A festive, community-oriented event, the powwow attracts members of the Native American community from throughout the country, has had past attendance totals of 1,500 spectators and participants, and is open to the entire IU community and the general public at no cost. "The IU Annual Traditional Powwow is something I truly look forward to each year, because not only is it a great way to honor the Native American community, but it's an inclusive event that allows the IU community to come together and have a good time," said James Wimbush, vice president for diversity, equity and multicultural affairs, dean of the University Graduate School and the Johnson Professor for Diversity and Leadership. "In his first year as the director of the First Nations Educational and Cultural Center, Nicky Belle has organized a terrific event with wonderful guests and activities." The powwow will feature two dance sessions, taking place from 1 to 5 p.m. and 7 to 10 p.m. Each session will begin with a grand entry, where the participants, including the dancers and flag-bearers, will demonstrate the dance styles. The sessions will feature dance exhibitions and intertribal dancing, which is open to spectator participation. The first session will include an honor song for the IU First Nations Leadership Ambassadors Council at 1:45 p.m. The event will also include dance group exhibitions from 5 to 7 p.m., featuring Paso a Paso, an IU Latino student dance organization, and the Indiana School of Polynesian Arts, which will perform traditional and modern hula dancing. In addition, there will be exhibitions of hoop dancing and smoke dancing, two traditional Native American styles of dance. This year will also mark the first time in its history that the powwow will take place outdoors and occur in the spring, as opposed to the fall. "The powwow has continued to grow over the years, so it's great to have it in Dunn Meadow, where it is much more visible and more accessible to the campus and local communities," said Nicky Belle, director of the First Nations Educational and Cultural Center. "If people are curious after seeing or hearing the dancing and singing, I hope they feel welcome to come participate. "I'm also very excited about our head staff, who have tremendous knowledge and strong followings that we expect to come to Bloomington, as well as the involvement of our campus partners." The head staff at the 2017 IU Sixth Annual Traditional Powwow includes Terry Fiddler, master of ceremonies; Mack Kingbird, arena director; Juaquin Hamilton, head man dancer; and Amber Old Horn, head woman dancer. The powwow will be run in the Northern style, which traces the history of its singing and dancing to the Northern Plains, mostly North Dakota and South Dakota, but also the Great Lakes region. Along with the First Nations Educational and Cultural Center, the powwow's co-sponsors are the Office of the Vice President for Diversity, Equity and Multicultural Affairs, the Annual Traditional Powwow Committee, the American Indian Student Association, the Native American Graduate Student Association, the American Indian Studies Research Institute, the Glenn A. Black Laboratory, the Mathers Museum of World Cultures and the departments of anthropology, history, and Native American and indigenous studies. Before the powwow, the recently established IU First Nations Leadership Ambassadors Council will convene for its inaugural meetings April 6 and 7. Nicky Michael, tribal council member of the Delaware Tribe of Indians and a member of the council, will give a pre-powwow lecture the evening of April 7 at IU's Mathers Museum of World Cultures. The event is free and open to the public.